The Community Foundation Iasi (Fundatia Comunitara Iasi) challenged RO-Talent to a quest: selecting 5 talented youngsters who will get a grant from the community for their performances and for supporting their pursuit of success. 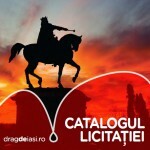 The fundraising for these grants will be organised during the “Drag de Iasi” Gala (16th of February 2012), when a unique auction of the “things you cannot buy” will be open. Given that the number of seats are limited and the participation is by invitation only, you might consider bidding online on Gala’s website for other great things. There is no doubt that all five brilliant youngsters, Georgiana Chelarasu, Mario Galatanu, Brenda Istrate, Andrei Pasa and Simona Sarbu, who proudly represent our community on the local and international level, will be at “Drag de Iasi” Gala.